June in Oregon can only mean one thing....Strawberries. There is nothing sweeter than strawberries grown in Oregon. Plump and juicy sweet..our current spring has been the perfect blend of warmth and moisture, producing some of the tastiest berries I have ever grown. My strawberry patch is about 15 feet long by 3 wide. My plants are grown in a raised bed that provides excellent drainage. I keep my strawberries separate from my other vegetables and fruits in the garden. When I purchase my original six plants, the tag said they were an everbearing variety. However, after researching the habits of my plants, I would say mine are a June bearing variety as they produce a lot of runners. I've been growing strawberries since 2006. I purchased six plants. I grew a similar sized patch (about 12 x 4 feet) from those original plants at my previous home. I used the runners to start more plants. The runners produce 'daughter' plants. Using daughter plants is not always recommended as you can pass disease from the mother plant. I may be lucky, but I have had no disease. I took daughter plants to our new home two years ago and started a new patch here. I will add that I only use organic, composted matter, to fertilize my plants. Here are some tips that I could share to other's thinking of starting their own strawberry patch. 1) Research the variety you select to match your weather / micro climate. 2) Provide excellent drainage and full sun. 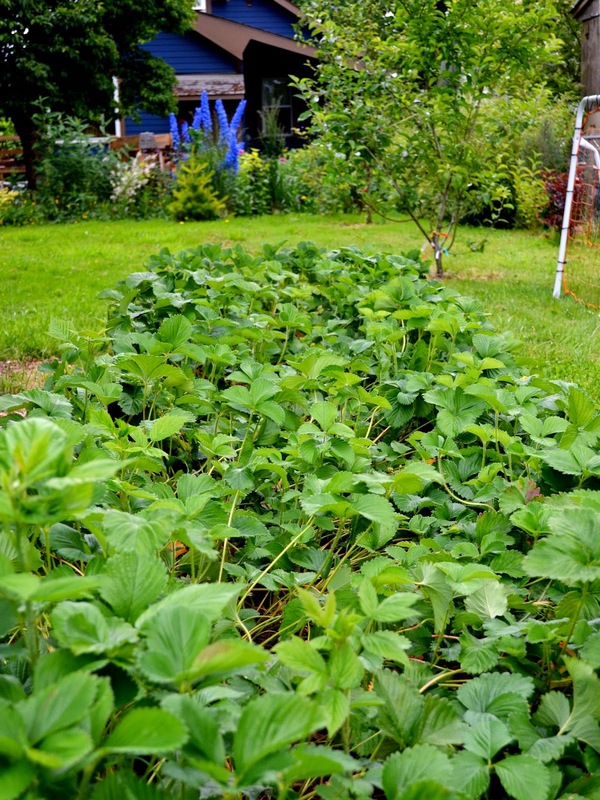 3) Add compost in the fall to your strawberry patch. 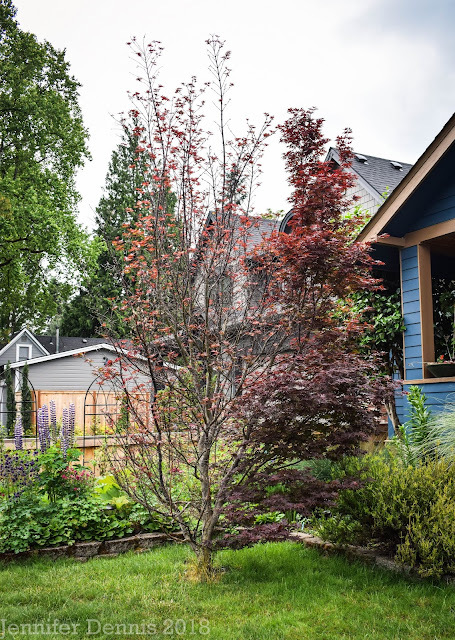 4) Cut runners / prune plants back in early March (here in the Pacific Northwest). This helps the plant focus it's energy on itself, not growing new plants. At this pruning time, this is an excellent time to take healthy runners and expand your strawberry patch. Remove old leaves and keep your patch tidy. 5) Weed your patch early in the season. Once the plants get larger, it's hard to get in-between and pull the weeds out. Keeping the weeds out helps reduce competition for moisture and also keeps better airflow around the plants. 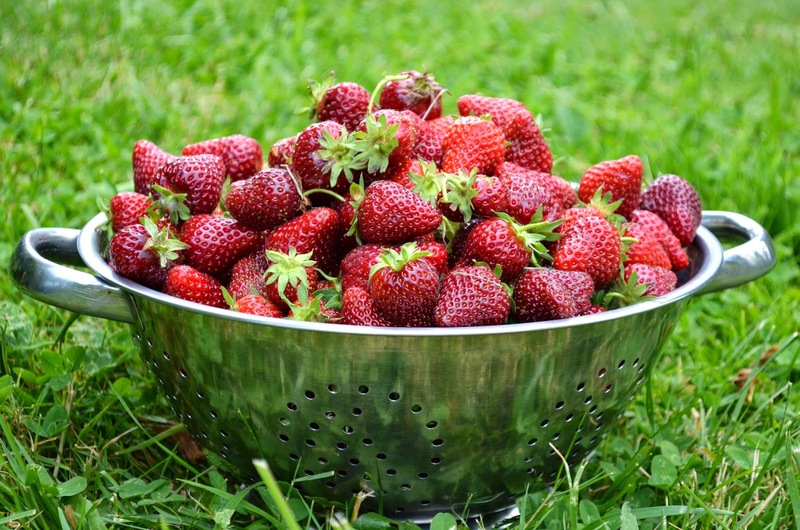 7) During strawberry season, pick and toss out the berries that get moldy or have been chomped by bugs. Keep your berry patch tidy and disease, mildew and bug free. 8) Don't use chemicals to get rid of pests. Rotate and start your crop elsewhere if you cannot get rid of disease and start over. You are what you eat. 9) Get your family involved at harvest time. Kids love to pick berries. Make a batch of freezer jam, or hull, slice and freeze for later use. There is nothing I love more than to pull a bag of frozen strawberries from our freezer in the middle of winter. Strawberries are easy to grow and even better to enjoy....and for those of you new to growing edibles..they are hard to kill. Really. 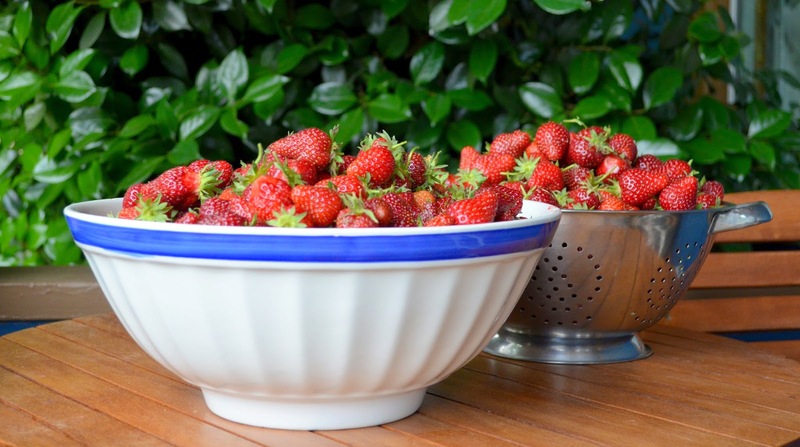 If you decide to start growing strawberries in June, you will need to water them to help them mature and root during their first summer. But after that...it's pretty smooth sailing. I water my established patch about every three days, but only during the hottest part of summer (about late July through August). Otherwise, I leave them alone. No space for a strawberry patch? Consider growing them as a ground cover in your flower beds! 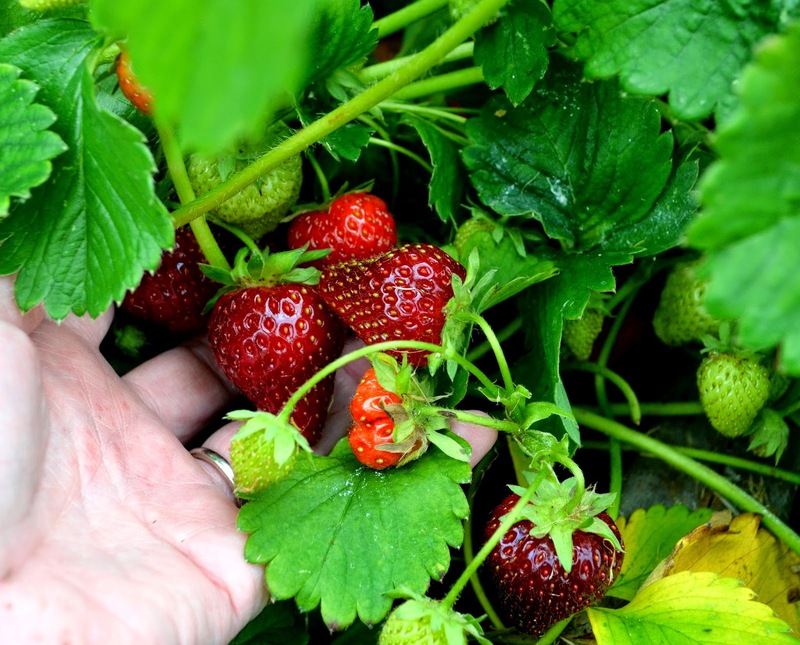 Check out this helpful pdf from the Oregon State Extension Service on home growing strawberries. Excuse me now, as I have a bowl of juicy strawberries waiting for me to eat! Dear Jenni, I have grown strawberries in a containerpot. the first ones are coloring. Can't wait to eat them. But it will not be a large bowl to harvest, I only have 6 plants. Hello Hetty! Strawberries are perfect for containers.I hope you get a bunch! A very useful guide! I have precious little space in my little garden, so I have taekn to growing Strawberries in plastic crates, which seems to work well, though I do envy you your 15ft x 3ft bed! Your berries are a very dark colour; what variety are they? Hi Mark, I don't know what variety they are. It's possible they are Hoods, which are very popular here in the Pacific NW. They are well acclimated to our climate. But, I'm not completely sure what mine are. We are replacing our strawberry bed next year but we'll be buying new plants as we want to try different varieties, At the moment we are having too much rain and not enough warmth. Yummy. I love strawberries. My dream is to have a garden area big enough to plant a patch. yummy, your strawberries look great and delicious! Even in Austria we start the strawberry season now, but mine are not so wonderful! I'll take your advices! Thank you for sharing them! Lovely post. I bet the children are very happy with the strawberries too! Enjoy this time. Wow, those look so good! I appreciate the tips. This is my first year with a strawberry patch (planted last summer). They are growing huge and tall and are just loaded with berries. I can hardly wait for them all to get ripe! Enjoy Linnae! This season is producing super tasty berries! What a wonderful guide to growing berries and yours look awesome! Just a thought for people who have never picked berries commercially. If you are going to have to hull the berries anyway for your intended use, pick them without the stems! I picked berries in the Willamette Valley for years as a child and that is how we learned to do it. When I gifted friends here in Eastern WA with fresh berries from our patch, they have very graciously told me that I didn’t have to hull them for them, too, as they know how long it takes - they were surprised to hear they were picked that way and it took no more time! Very helpful and yummy post. Thank you Jennifer! After how many years do you discard a plant?